Place mascarpone, vanilla ice cream, and milk in a blender; cover and blend until smooth. Transfer mascarpone mixture to a bowl; set aside. Rinse blender container with water; drain. Place chocolate ice cream and espresso in the blender; cover and blend until smooth. Combine confectioners’ sugar and cocoa in a small bowl. 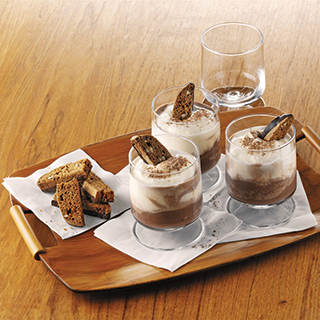 Pour chocolate mixture into 4 glasses; top with mascarpone mixture. Sprinkle with sugar mixture.